May is National Blood Pressure Month and in honor of this tribute, we have put together five ways to control high blood pressure. But before we get to these five handy tips, it’s important to understand what blood pressure is, what it should be, and why individuals should strive for a lower blood pressure. Your blood pressure is made up of two numbers: the systolic blood pressure and the diastolic blood pressure. The systolic blood pressure (the upper number) indicates how much pressure your blood is exerting against your artery walls when the heart beats. The diastolic blood pressure, the lower number, indicates how much pressure your blood is exerting against your artery walls while the heart is resting between beats. A high blood pressure means the pressure in your arteries is higher than it should be. In fact, according to the American Heart Association, nearly half of the American population over the age of 20 is diagnosed with high blood pressure, also known as hypertension. The only way to know if you have high blood pressure is to get it checked regularly by your healthcare provider. Checking blood pressure is standard procedure during CardioMender, MD visits for all of our patients. If you wish to find out your blood pressure levels, contact us to schedule a consultation. 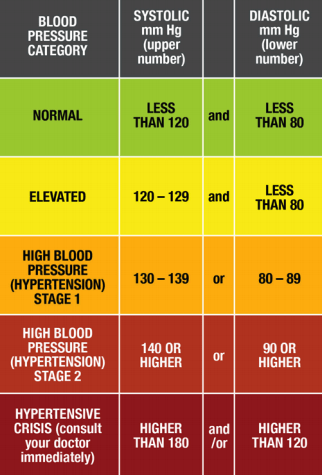 Use the chart below to indicate your blood pressure levels. The blood pressure chart is suitable for adults of any age. Blood pressure readings have two numbers, for example, 140/90 mm Hg. The higher your blood pressure the higher the risk of health problems in the future. When your blood pressure is high, you are putting extra strain on your arteries and your heart. Over time, this extra strain can cause the arteries to become thicker and less flexible, making it easier for them to become clogged. If an artery completely clogs up, it can lead to heart attack, stroke and kidney disease. The good news is that there are many ways each of us can lower blood pressure. We have provided five handy tips on how to do so. 1.Eating a well-balanced diet. At CardioMender, MD we believe that eating wholesome, good food is the key to a long, productive, healthy life. We develop weight loss plans that incorporate foods low in saturated fats and trans fats, rich in fruits and vegetables, and include low-fat dairy products. Additionally, we encourage our patients to consume foods high in fiber. 2. Exercise. Aim for 90-150 minutes of aerobic exercise per week. During the initial phase of our wellness transformation, the staff at CardioMender, MD will conduct a personal assessment to evaluate your activity level. 3. Reduce Sodium Intake. Aim to consume less than 2,400 mg of sodium (salt) a day. If you currently use regular table salt you should consider replacing it with Lite Salt (Morton™), which substitutes half the sodium of regular salt with potassium but tastes the same. CardioMender, MD includes a variety of low sodium, healthy options including Doc’s Roasted Garlic Spread. 4. Maintain a healthy weight. To achieve optimal health, we encourage our patients to lose weight and keep it off. Unlike diet programs and fads, we continue to provide support once you have reached your goal weight and your body fat is maximally reduced. “We have seen hundreds of patients who have gone off their blood pressure medications when they reached a healthy weight and maintained it,” stated Dr. Schiff. Diets do not work, therefore incorporating our 3-phased wellness plan will allow you to lose the weight and maintain a healthy lifestyle. 5. Eat Foods Rich in Potassium. Aim for 3,500-5,000 mg of dietary potassium per day, as recommended by your healthcare provider. Please consult your healthcare provider when beginning a diet or instituting a new nutritional plan*. Feel free to call CardioMender, MD Weight Loss Specialists at 954.628.3802 and we will be happy to schedule your appointment with us promptly! You’ve Got to Live It! *Disclaimer – Statements made are for educational purposes and have not been evaluated by the US Food and Drug Administration. They are not intended to diagnose, treat, cure or prevent any disease. You should consult with your physician before making decisions about therapies and/or health conditions.